DKAN is the all-in-one open data platform. 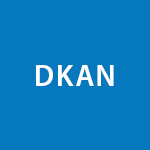 DKAN is an open source, open data platform with a full suite of data and content management cataloging, publishing and visualization features that empower organizations to easily distribute public data in easy-to-consume formats. It provides features that make it easy to upload, parse, store, publish, catalog and visualize a vast array of data, including spreadsheets, text documents and maps.